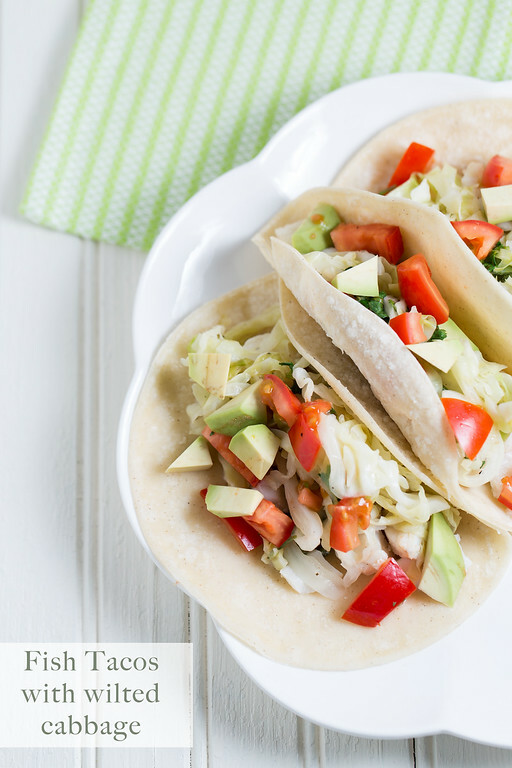 Fresh tomatoes and avocados combine with sautéed cabbage in these healthy Fish Tacos with Wilted Cabbage. Post may contain affiliate links. When it comes to fish tacos, I am a purist. I like mine as simple as can be with fresh flavors. When creating fish tacos you can take a few different routes with the fish. It can be battered and fried, sauteed, or even grilled. Honestly, I like it all three ways, though if you want to go lighter, sauteed or grilled is your best option. After deciding on how to handle your fish for your fish tacos, then you next decision is toppings. Toppings range from coleslaw style, smokey sauces, creamy sauces, tomatoes, salsa, avocado, and crema to name a few! If you start googling fish tacos, you will find that people are pretty adamant about how to make them and what should be on them. According to Rachel Aron’s at Slate, they have to be fried, though I think that Bobby Flay makes a pretty good plea for having them grilled, Bobby Flay’s Grilled Fish Tacos, and the fish tacos in today’s recipe, show how excellent and easy they can be just simply sauteed. Honestly, I’ve never met a fish taco that I didn’t love! I found this recipe in Mark Bittman’s, The Food Matters Cookbook: 500 Revolutionary Recipes for Better Living – a cookbook I definitely don’t cook from enough. I find it so useful when I’m looking for recipes that have smaller quantities of meat/protein and larger quantities of fruits/vegetables. What I liked about this recipe is that instead of the traditional more coleslaw style of cabbage, this cabbage is sauteed. It makes it a little more warm-ish for a winter taco. I also like that the cooked fish is stirred back into the cabbage, so the flavors combine as opposed to a fish and then a topping. The only thing I changed was that I omitted the chili powder, I just wanted this to be really clean and fresh tasting and I was afraid the chili powder would overpower the fish and cabbage. 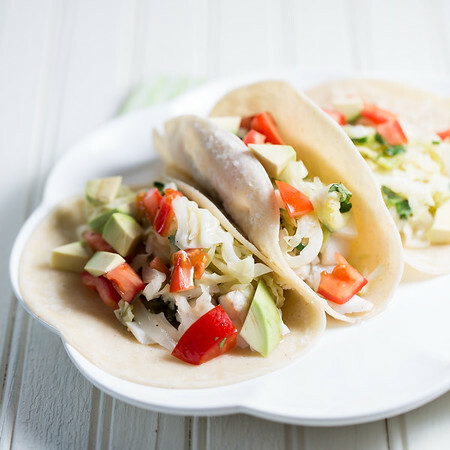 These Fish Tacos with Wilted Cabbage can be on your table in under 30 minutes! Heat 2 tablespoons of oil in a large skillet over medium-high heat. Add the chile pepper and the fish and sprinkle with salt and pepper. Saute until the fish is just cooked through, about 2 minutes. Remove from the pan and turn the heat to high. Add 1 tablespoon of oil to the skillet with the cabbage, 1 tablespoon of water, and salt and pepper. Cook, stirring until the cabbage begins to wilt, about 5 minutes. Turn off the heat and add the cilantro, lime juice, chili powder (if using), and fish. Taste and adjust the seasonings. Warm the tortillas one at a time in a dray skillet over medium heat, just a few seconds each side. Scoop the fish cabbage mixture into each tortilla and top with tomato and avocado. Oh how I would love to line up a whole bunch of fish tacos for a taste test to see how my preferences come out. I do know that I like all components of your tacos though, so they would be sure to rank highly with me. Love these fish tacos! The wilted cabbage is the perfect addition! Would you believe I have never had a fish taco, Pam??? I’m really liking the way you approached this recipe. Light and fresh seems to be my frame of mind these days. The wilted cabbage is the perfect touch! Oh Pam, your tacos look fabulous. What a great idea to use wilted cabbage instead of the usual slaw. Hope you have a great weekend. You nabbed me with the spice and lime. I avoided fish tacos for a long time, fearful they’d be, well, too fishy! I think the secret is fresh fish and wonderful flavors as you shared here. funny how people’s tastes vary so much. I for one only like fish tacos grilled and like you am a minimalist when it comes to toppings, cilantro pico de gallo, avocado & lime and of corse cabbage! Can’t wait to try your sautéed version! these tacos look very delicious. Luv fish tacos Baja style, grilled, etc. So much lighter than using meat and goes so well with a lot of lime or lemon! Will try your wilted cabbage method. Delicious! I;m with you, I like my fish tacos pretty simple and straight forward, and I love this cabbage! I agree with you, I love my fish tacos very simply prepared. The wilted cabbage sounds like such a good idea for the topping. Simple and fresh. I love any kind of fish taco! Combining it with the wilted cabbage sounds delicious! I love a good fish taco and the wilted cabbage seems like the perfect marriage! We have Wahoo’s restaurants here that specializing in fish tacos. They are awesome… LOVE grilled fish tacos. Thanks for sharing at the #HomeMattersParty – We hope to see you again next week. We will really enjoy the flavors of these Tacos! Hope you had a great Valentine weekend and thanks so much for sharing your awesome post with Full Plate Thursday. I usually make shrimp tacos, but this sounds really delicious! What fish did you use? My husband loves tilapia, but I’m not a big fan, preferring something a little firmer. I’ll add this recipe to my menu for the coming week. Thanks, Pam! I have only recently discovered fish tacos and we used grilled fish and lettuce. Not sure I could handle the raw cabbage. These are gorgeous. And now I desperately want fish tacos. I’ve never had a fish taco! I like my fish in nicely sauteed filets, without any garnishment. Boring, I know. But I’d try these if I were going to make fish tacos! Oh my Pam, these look delish! Gorgeous! What a great looking dish! I’m dreaming of fresh and springy like dishes these days and this gives me the colour and crunch that I’m missing from the winter comfort foods. Thanks for a great recipe. Beautiful photos! I love fish tacos too…usually fried, and mostly with some sort of lime or chipotle cream sauce. But like you, I have yet to find a fish taco I don’t like, so I am always game for a new recipe! And I have never sautéed my cabbage. Looking forward to trying this. If you have a free moment, I’d love it if you’d stop by our place and share it with our #FoodieFriDIY party…we went live last night. Have a great weekend! People definitely have different requirements for their fish tacos! I like that this cabbage is a bit warmed…I prefer it with a little less crunch anyway!